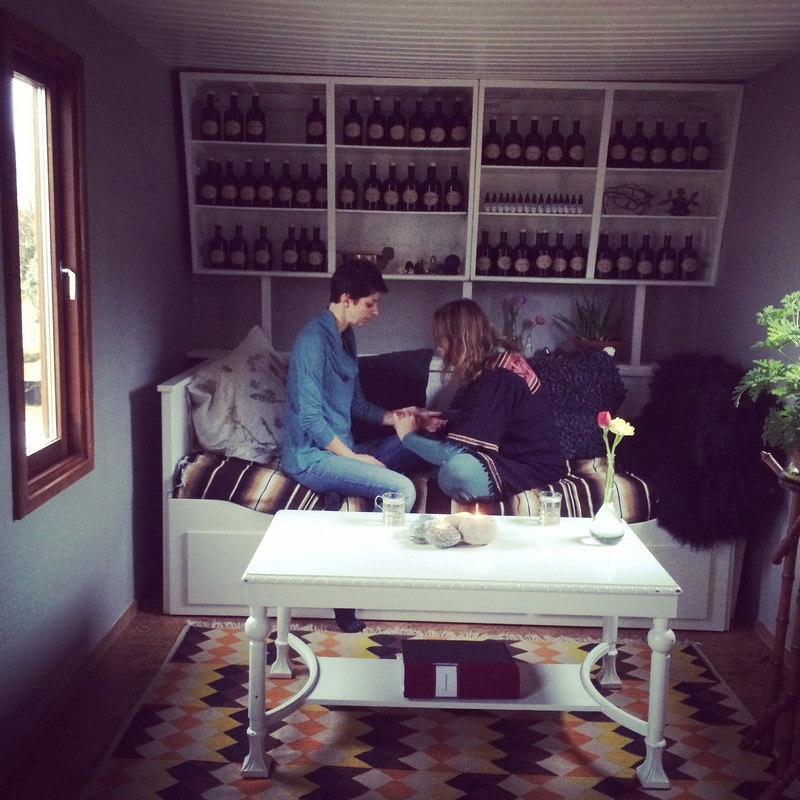 It is possible to schedule a consultation and visit Alchemillas Apotek for guidance. I approach my clients with care and respect . I am a trained Ayurvedic health counselor with a diploma from Yantra Ayurveda. Ayurveda or the knowledge of life (Ayur: knowledge, veda: life), is an Indian art of healing dating back to the Vedic culture. With thousands of years experience, Ayurveda is one of the world’s most sophisticated and powerful mind-body health systems. As with ancient natural philosophy and alchemy, Ayurveda is based on the elements: space, air, fire, water and earth. The essence of Ayurveda are the three doshas; Vata (space-air), Pitta (fire-water) and Kapha (earth-water). It is a system to understand the energetic patterns of the universe within the framework of three basic principles: movement, change and stability. Every individual has a unique nature beyond the imbalances that may come and go in one’s system. A persons constitution contains the three doshas in different proportions. Through Ayurveda, we can find the tools to create our own health, develop self understanding and support in being who we really are. The mind and body are inextricably connected, and nothing has more power to heal and transform the body than the mind. We start by talking about where you are right now in life combined with nail, pulse and tongue diagnosis. Based on your current situation and your unique constitution you will receive counsel in the form of diet and lifestyle recommendations, breathing exercises and herbal recommendations. Let food be thy medicine! We are all unique. Not everybody benefits from eating the same diet. In Ayurveda, the season, the true nature of the person and the temporary imbalance that might be going on is taken into consideration. Food is life and you are what you eat! Ingest the intelligence of nature, unprocessed, grown without poisoning the earth or you, colourful and full of flavour, and let it become who you are! Welcome to experience a gong-session. The gong brings healing and transformation on all levels. 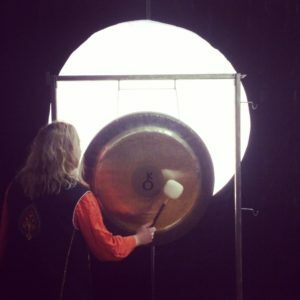 On the physical , to the emotional and spiritual levels the vibrations and frequencies of the gong can initiate a positive change when experiencing a gong-bath. 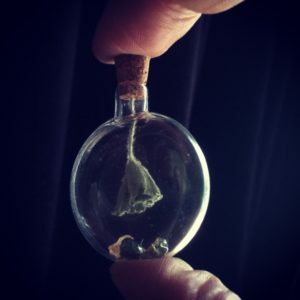 Lisa creates talismans from minerals and herbs in small glass vials to support the needs and wishes of the individual. They are composed like an elixir that can be worn as a magically charged piece of jewelry or object that can be placed in the workplace, hanging over the bed, in the kitchen or wherever it is needed. The talismans costs between 200-600 kr depending on what they contain. A description is included. We discuss over Skype or by e-mail and make a plan and a price before I get to work. So far Lisa has created talismans to support selfhood, for incontinence support, to aid in letting go on several levels (constipation / mental release), to support creative flow, mental focus and many others. They have found content owners who experience positive benefits. 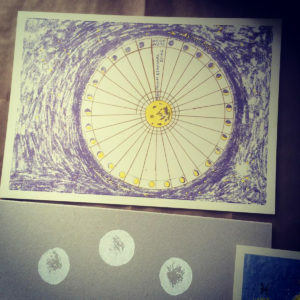 The Moondala is a map that connects and contextualizes the cycles of the moon and your personal cycle, so that you can comprehend the patterns of each phase of the lunation and how you can work together with the forces of the universe. A lunar calendar is a calendar based upon cycles of the Moon’s phases. Each lunation is a little less than 29 days, 12 hours, 44 minutes, and 3 seconds. Month after month, the moon cycle mirrors a woman’s menstrual cycle, which coincidently has an average length of 29.5 days as well. And similar to the moon cycle, a woman’s menstrual cycle changes from the menstruation of new growth, to the ovulation of full power and blossom, to the pre-menstrual phase of harvest and degeneration, and back to menstruation of renewal again. All life forms have cycles of birth, growth, death, and renewal that are mirrored in the progressive phases of the moon cycle. The moon has four phases or quarters lasting about seven days each. The first two quarters are during the waxing or increasing light, between the new and the full moon. The third and fourth quarters are after the full moon when the light is waning, or decreasing. Gravitational pull influences moisture in soil. Human beings consits largely of water. Planting by the moon is an idea as old as agriculture, based both in folklore and magic, but there are scientific ideas to back it up. The Earth is in a large gravitational field, influenced by both the sun and moon. The tides are highest at the time of the new and the full moon, when sun and moon are lined up with earth. Just as the moon pulls the tides in the oceans, it also pulls upon the subtle bodies of water, causing moisture to rise in the earth, which encourages growth. The highest amount of moisture is in the soil at this time, and tests have proven that seeds will absorb the most water at the time of the full moon. After three months mapping your moon, you will star to notice the patterns in your cycles that you were maybe never aware of; patterns that will give you keys on how you flow and how you are connected to the universe. The first day of bleeding is counted as the first day of the cycle, and the cycle ends in the last day before the next period. If you do not bleed, you can start mapping on the new moon. This moondala was created by Lisa Jeannin for the Alchemist´s Kitchen and the Travelling Medicine Show at Het Bos in Antwerpen during the Alchemical spring and sign of Aries. Ashwagandha strengthens the immune system, the male and female reproductive system and is especially helpful in case of a burned out nervous system. Ashwagandha is used to tone, support, and revitalize bodily functions. It is an adaptogene with a paradoxical dual capacity to energize and calm at the same time. Stress can cause fatigue, often manifesting as “hyper” signs like agitation and difficulty sleeping. By providing a nourishing yet energizing effect, the nervous system is soothed and supported. When the stress doesn’t impact the nervous system as strongly, the “hyper” signs will naturally resolve over time, allowing for a calming effect. This quality of Ashwagandha makes it rejuvenating. Ashwagandha is incredible for the person who has burned the candle at both ends, or to come back after a period of illness. It is one of the most famous ayurvedic herbs. It helps a person to have stronger benefits from rest and sleep. 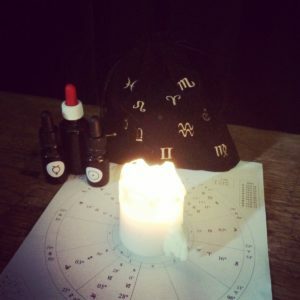 From your astrological birth chart I create unique spagyric formulas to support your vital force, inspired by Nicholas Culpepers Astral Formula and my astrological and herbal intuition. 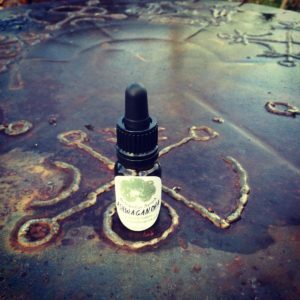 My gift is to match the characteristics of the herbs with the characteristics of the human, the archetypes of the zodiac and celestial bodies. This is not a traditional astrological consultation, focus is on the herbs – how the vital force is manifested through you and how herbs can support the flow of this vitality. I need to know the date, time and place of birth. 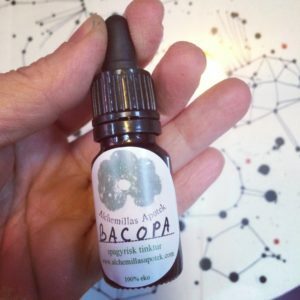 You receive 50 ml spagyric tincture and consultation over Skype or telephone 1-2 hours, for the cost of 1500 kr + shipping. 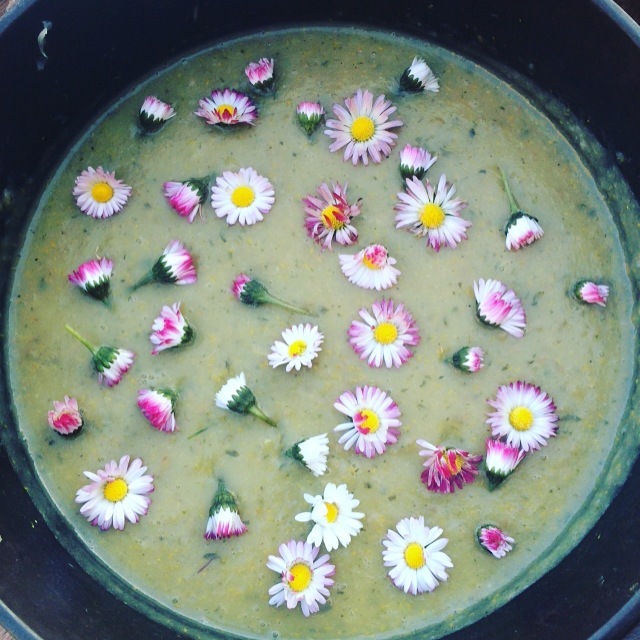 Lisa Jeannin holds workshops in the spagyric art and herbal alchemy. 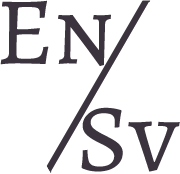 Check for upcoming dates via our Facebook site, on the blog or announced via our newsletter. 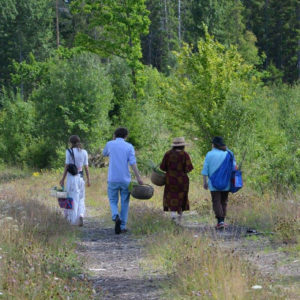 You can also invite Lisa to hold lectures, plant walks or workshops in spagyria, herbal alchemy, and the healing power of herbs. Please email us for inquires. There is a workshop this summer read about it here.